By Keith Cowing on February 27, 2009 4:36 PM. "NASA has awarded an interim letter contract to Oceaneering International Inc. of Houston to begin work on the design, development and production of a new spacesuit system for the Constellation Program. The system will protect astronauts during voyages to the International Space Station and exploration of the moon's surface. The letter contract requires Oceaneering International to begin work on the basic period of performance while NASA and the company negotiate the contract's final terms." By Keith Cowing on February 27, 2009 3:43 PM. "NASA: While there's plenty of money alloted to help fund the goal of getting Americans back on the moon by 2020, Obama's budget creates a gap between the current Space Shuttle program, set to expire in April 2010, and the next-generation Constellation program, slated for takeoff in 2015. During the "Shuttle gap" the U.S. will depend on Russia for rides to the International Space Station. Members of the Space community are understandably concerned about the five-year gap. In the words of one NASA observer: "Why would you send the money to Russia to launch our astronauts when you could keep the money and the jobs here?" Editor's note: Obama's budget does not "create" a gap - rather, it does not close the one that already existed - and has existed since 2004. By Keith Cowing on February 27, 2009 1:32 PM. "As part of an ongoing collaboration, NASA and the U.S. Chamber of Commerce (USCC) Space Enterprise Council (SEC) are conducting a workshop on NASA Lunar Surface Systems (LSS) Concepts. The objective is to provide a status of NASA's lunar surface exploration architecture, to share results of recent innovative lunar concept studies, and to seek feedback from U.S. industry and other interested parties." By Keith Cowing on February 26, 2009 8:03 PM. Editor's note: These charts by Nick Skytland, NASA JSC, were used as part of his presentation at the NASA PMC 2009 conference. Alas, Nick selectively plugs a non-NASA website - spacehack.org - a site that openly blocks some people from "collaborating" with what it does. Curiously, Nick cites this website in a presentation that is all about collaboration. One other thing, how is it that a NASA civil servant can exert usage restrictions on a document he created as a civil servant as part of his official duties? (see last chart). These materials are in the public domain. "I invite you to visit this web site, and read where Nick Skytland, a Gen-Y civil servant at Johnson Space Center (JSC), posted a presentation from the PM Challenge conference entitled "Participatory Exploration: The Role of the User Contribution System." Go ahead, I'll wait. Okay, now that you've read that, I'll make some obligatory grumpy comments. These are being written in the spirit of constructive criticism, not "Siddown, kid, and wait your turn!" I'm looking at specifics in the presentations and so am asking/commenting about specifics." By Keith Cowing on February 26, 2009 6:33 PM. "We found 21 SRB members--close to one-third of all non-Federal CxP SRB members-- with conflicts of interest and determined that each of the SRBs for CxP and its constituent Projects included at least one non-Federal Government employee who was conflicted. Specifically, each SRB included at least one non-Federal Government employee who was an employee or consultant of a NASA contractor with an interest in or contract with either CxP or one of its projects. For example, the 12 non-Federal members of the CxP SRB included 4 members (33 percent) who were not independent." By Keith Cowing on February 26, 2009 5:57 PM. 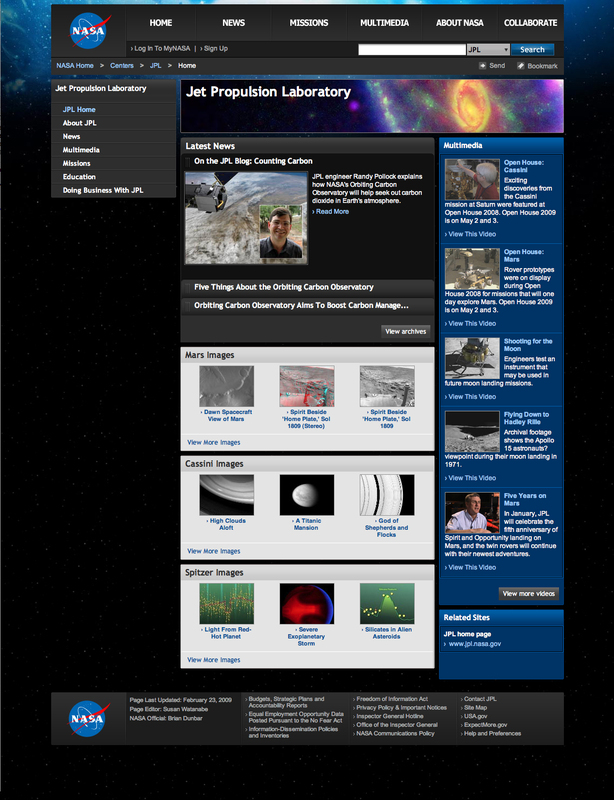 Editor's note: Check out the NASA JPL home page http://www.nasa.gov/centers/jpl/home/index.html. It would seem that someone doesn't know that OCO made a big splash off of Antarctica earlier this week. Editor's update: They fixed it. This is what it looked like before the fix. By Keith Cowing on February 26, 2009 5:35 PM. "NASA's chief climate scientist is in hot water with colleagues and at least one lawmaker after calling on citizens to engage in civil disobedience at what is being billed as the largest public protest of global warming ever in the United States. In a video on capitolclimateaction.org, Dr. James Hansen is seen urging Americans to "take a stand on global warming" during the March 2 protest at the Capitol Power Plant in Southeast Washington, D.C. ... ... "Jim Hansen is performing a tremendous job at communicating our science to the public and, more importantly, to policymakers and decision-makers," Franco Einaudi, director of the Earth Sciences Division at NASA's Goddard Space Flight Center, said in a press release." "But NASA is defending Hansen's right as a private citizen to engage in the campaign. "He's doing this as a private citizen on his own time and there's nothing wrong with that," said NASA spokesman Mark Hess. "There's nothing partisan here. You don't give up your rights to free speech by becoming a government employee." Editor's note: I guess this is about as clear a signal as any NASA employee can expect to get that they can now speak out publicly - with attribution - about any topic they wish - including overtly work-related topics - without any fear of reprimand, sanction, or criticism from their management, right? Very important - if it is true, that is. Why not push the envelope and see what happens? If your boss comes after you, just cite the Hansen precedent. By Keith Cowing on February 26, 2009 2:15 PM. By Keith Cowing on February 26, 2009 12:57 PM. "Acting NASA Administrator Christopher J. Scolese said the following in response to the 2010 fiscal year budget overview for NASA released Feb. 26: "The $18.7 billion budget proposal for 2010 is fiscally responsible and reflects the administration's desire for a robust and innovative agency aligned with the president's goals of advancing our nation's scientific, educational, economic and security interests. "This budget ensures NASA maintains its global leadership in Earth and space research, and it advances global climate change studies, funds a robust program of human and robotic space exploration, allows us to realize the full potential of the International Space Station, advances development of new space transportation systems, and renews our commitment to aeronautics." "The President's Fiscal Year 2010 Budget provides $18.7 billion for the National Aeronautics and Space Administration (NASA) which, when combined with the $1 billion provided for NASA in the Recovery Act, is more than $2.4 billion above the 2008 level. The Budget funds a program of space-based research to advance our understanding of climate change and its effects, as well as human and robotic space exploration. It also supports the use of the Space Shuttle to complete assembly of the International Space Station." By Keith Cowing on February 25, 2009 8:59 PM. Rohrabacher Condemns European Satellite Company's Use of Chinese Rockets Calls China "Weapons of Mass Destruction Proliferator"
"Congressman Dana Rohrabacher (R-CA) issued the following remarks during today's Science and Technology Full Committee hearing on the "Impacts of U.S. Export Control Policies on Science and Technology Activities and Competitiveness." Rep. Rohrabacher specifically addressed his concerns regarding the recent announcement of an agreement between European satellite operator Eutelstat and the Peoples Republic of China to use Chinese rockets to launch private communications satellites. Since 1998, U.S. export controls have prohibited the use of Chinese rockets to launch satellites containing American made parts." By Keith Cowing on February 25, 2009 8:47 PM. "Iranian-born Samim Anghaie, 59, is the Director of the Innovative Nuclear Space Power and Propulsion Institute at the University of Florida. His wife, 55-year-old Sousan Anghaie, is president of New Era Technology Inc. (NETECH) in Gainesville, Fla. Authorities say Sousan Anghaie persuaded NASA to award her company "several fully funded contracts," including nearly $600,000 to develop and study a uranium-related technology. But, according to an affidavit unsealed today in federal court, the couple allegedly used most of that money to buy personal luxuries -- including their $480,000 home in Gainesville, a 2007 BMW and a 2005 Toyota Sienna sports van. They also used that money to buy a property for their son in Tampa, Fla., a property for their other son in Manchester, Conn., a 2008 Toyota Corolla for Sousan Anghaie's sister, and a 2007 Toyota Corolla for another family member." "Robert "Moose" Cobb, NASA's inspector general, would not provide further detail. "We don't comment on ongoing activities," he said. He also would not elaborate on the frequency of theft at NASA. Dan McLaughlin, a spokesman for U.S. Sen. Bill Nelson, D-Fl., acknowledged that Nelson met with Anghaie in 2007. The two men discussed the Alpha Magnetic Spectrometer - a $1.5 billion international physics experiment that researchers hope to one day mount aboard the International Space Station. NASA has balked, however, because it does not have enough money to fly another shuttle mission to carry the experiment." By Keith Cowing on February 25, 2009 7:51 PM. "NASA's Space Shuttle Program has established a plan that could support shuttle Discovery's launch to the International Space Station, tentatively targeted for March 12. An exact target launch date will be determined as work progresses with the shuttle's three gaseous hydrogen flow control valves. The Space Shuttle Program will hold a meeting March 4 to review new data and assess ongoing work. Managers then will determine whether to move forward with a flight readiness review March 6." By Keith Cowing on February 25, 2009 7:28 PM. "The fiscal 2010 NASA budget outline to be released by the Obama Administration Feb. 26 adds almost $700 million to the out-year figure proposed in the fiscal 2009 budget request submitted by former President Bush, and sticks with the goal of returning humans to the moon by 2020. The $18.7 billion that Obama will request for NASA - up from $18.026 billion for fiscal 2010 in the last Bush budget request - does not include the $1 billion NASA will receive in the $787 billion stimulus package that President Barack Obama signed Feb. 16. Aviation Week has learned that in addition to the human-lunar return, Obama wants to continue robotic exploration with probes to Mars and other Solar System destinations, as well as a space telescope to probe deeper into the universe." By Keith Cowing on February 24, 2009 11:55 PM. "For the closeout of all Space Shuttle contracts and associated programs, amounts that have expired but have not been cancelled in the Human Space Flight, Space Flight Capabilities, and Exploration Capabilities appropriations accounts shall remain available through fiscal year 2015 for the liquidation of valid obligations incurred during the period of fiscal year 2001 through fiscal year 2009." (5) the costs of workforce transition; and (6) other costs related to Space Shuttle retirement and transition." By Keith Cowing on February 24, 2009 8:59 PM. By Keith Cowing on February 24, 2009 1:42 PM. But unless you use Twitter or knew to look at JPL's home page today and saw "Readying for Mars: Live 'Clean Room Cam' and Chat" you would not even know that this was going on. No media advisories or press releases were issued. There is no mention on the MSL website at JPL or here on NASA.gov's media site - or anywhere else on NASA.gov so far as I can tell. It is great that JPL is trying new stuff out, but they should not leave the rest of the world behind when it comes to informing people as to what it is doing. By Keith Cowing on February 24, 2009 8:55 AM. "NASA's Orbiting Carbon Observatory satellite failed to reach orbit after its 4:55 a.m. EST liftoff Tuesday from California's Vandenberg Air Force Base. Preliminary indications are that the fairing on the Taurus XL launch vehicle failed to separate. The fairing is a clamshell structure that encapsulates the satellite as it travels through the atmosphere. A Mishap Investigation Board will be immediately convened to determine the cause of the launch failure." "The satellite was launched from Vandenberg Air Force Base in California aboard a Taurus XL rocket, at 1:55 am (0951 GMT), live images on NASA TV showed. It was the first time NASA has used a Taurus rocket, built by Orbital Science Corp., the US space agency said in a statement posted Monday on its website." By Keith Cowing on February 23, 2009 6:07 PM. "The world will feature RPG-style elements and missions that prompt users to explore the environment and learn about their tools, all based on real NASA technology and prototypes, and working to solve real problems, like how to colonize and terraform other planets or deal with our own global warming. One way to solve those problems will be to create new tools and machines out of existing components, a sort of Lego approach, but Unreal will also let users dive in deeper to create new modules and elements as well." Editor's 20 Feb note: Wow. All this favorable news about NASA's foray into MMO gaming. Seems like NASA really picked a winning idea to pursue. And NASA's response to the publicity these past few days .... ? None that I can find. MMO-t csinl a NASA, IPON! NASA's Strategic Planning crowd is always trumpeting the "NASA Brand" as something that needs to be capitalized on - and used to reach new sectors of the population. So ... someone at NASA comes up with a bright idea, implements it, and guess what: it catches on - globally - and is now going "viral" to some extent. But does NASA bother to pay attention to its own success and capitalize upon it? Again, it would seem that they do not know how to - or they do not care to. They cannot even bring themselves to issue a press release about this news - and the outstandingly positive reaction that has, none the less, been generated. Utilizing NASA's brand awareness to further expand NASA's mission is great. But not taking advantage of initial success, once achieved, so as to expand the concept, is just plain dumb and is wasting a valuable and rare opportunity. By Keith Cowing on February 23, 2009 5:06 PM. "Space Florida President Steve Kohler -- under fire from legislators and space boosters for his group's checkered record of business development -- is trying to enlist the help of his critics in the aerospace community to improve the agency's image and effectiveness. In an email sent last Friday to members of the industry group that is planning an upcoming industry day in Tallahassee, Kohler acknowledged that the agency is facing "a time of focused scrutiny" from what he described as "few in the broader stakeholder community." Continue reading Space Florida Is Under Increased Scrutiny (Updated). By Keith Cowing on February 23, 2009 5:00 PM. "According to the St. Louis Dispatch, former payload specialist Robert J. Wood died in a car accident on February 19. Though he never flew in space, as an engineer with the McDonnell Douglas Aeronautics Company (later Boeing), Wood was chosen as the second industry payload specialist in March 1985 and served as backup to payload specialist Charles Walker on STS-61B." By Keith Cowing on February 23, 2009 3:31 PM. "Acclaimed reporter and anchor Miles O'Brien will return to broadcasting this spring as the anchor and correspondent of a BLUEPRINT AMERICA documentary on public television, tentatively titled: "Blueprint America: A Tale of Three Cities." The documentary, presented by WNET.ORG, will take viewers in and around three very different cities--Portland, Denver, and New York--to look past the headlines about crumbling roads and bridges and explore what kind of infrastructure Americans need to meet the pressing challenges of the 21st Century. O'Brien will set out to learn what must be done to keep the nation competitive in the global economy, while at the same time addressing the realities of climate change, diminishing natural resources and population growth." By Keith Cowing on February 23, 2009 3:00 PM. "This notice is issued in accordance with 42 U.S.C. 2459f-1(d). The 2009 Power Beaming and Tether Challenges are now scheduled and teams that wish to compete may now register. The NASA Centennial Challenges Program is a program of prize contests to stimulate innovation and competition in space exploration and ongoing NASA mission areas. The 2009 Power Beaming Challenge is a prize contest designed to promote the development of new power distribution technologies. The 2009 Tether Challenge is a prize contest designed to develop very strong tether material for use in various structural applications. The Spaceward Foundation is administering both Challenges for NASA." Editor's update: You'd think that IPP would want to tell people about this ... all I can find is last year's stuff. By Keith Cowing on February 23, 2009 1:17 PM. "Shana L. Dale, the immediate past Deputy Administrator of NASA, is joining the Potomac Institute for Policy Studies as a senior fellow. Dale is a recognized senior executive and leader in aerospace and homeland security, and has broad experience in national security. She also has extensive federal government knowledge and experience, and proven abilities navigating the legislative process, White House policy and procedures, and agency operations." By Keith Cowing on February 23, 2009 10:52 AM. "NASA and the U.S. Chamber of Commerce Space Enterprise Council will hold a workshop on lunar surface system concepts to support human and robotic exploration on the moon by 2020. The workshop will take place Feb. 25 - 27 at the U.S. Chamber of Commerce, 1615 H Street, NW, in Washington. The forum will provide a status of NASA's lunar surface exploration architecture and share results of recent innovative NASA, industry, and university lunar studies performed for NASA's Exploration Systems Mission Directorate and Constellation Program. NASA also will seek feedback from U.S. industry and other interested parties." By Keith Cowing on February 23, 2009 9:38 AM. "On Friday, February 27, your mailbox will be upgraded to Exchange 2007. It is extremely important that you DO NOT use your email between the times noted above. Any email messages sent during this activity window will be queued and delivered upon completion of the activity. Following this activity, the default mailbox size will be increased immediately from 200 MB to 400 MB. However, if you currently have a 500 MB mailbox, your mailbox size will be increased to 1 GB within 24 business hours." By Keith Cowing on February 23, 2009 8:43 AM. "ISRO has also been lobbying for years to secure government funding for its plans to send an astronaut into space by 2014 - eleven years after China - and to the Moon by 2020, four years ahead of China's target date. Critics say ISRO's plans are a waste of money in a country where the 76 per cent of the population of 1.1 billion live on less than $2 a day, and child malnutrition levels are on a par with sub-Saharan Africa. But ISRO argues that India makes money from commercial satellite launches, and scientific research from the space programme has helped to develop its information technology industry. Indian officials, especially in the military, are also concerned that India lags far behind China, which shot down a satellite in 2007 and completed its first space walk last year." By Keith Cowing on February 23, 2009 8:35 AM. "In 1967, while on the faculty at Southern Oregon College, Dr. Averner co-authored the world's first monograph on terraforming Mars, entitled, "On the Habitability of Mars: An Approach to Planetary Ecosynthesis." Terraforming, or altering the atmosphere of Mars to make it habitable for humans, via planetary engineering processes, is still being discussed in planetary circles and is the seed to more current discussions of planetary or geo-engineering to reduce the impacts of global warming on our planet." Mel Averner is survived by his ideas. By Keith Cowing on February 22, 2009 12:37 PM. Editor's 1 Mar update: This paper has been removed from the NSS blog but has been republished here. Editor's 2 Mar update: Buzz Aldrin has asked the other two authors of this paper to remove his name from it. "In our view, there were several fundamental problems with the Bush Vision and its implementation for Space Exploration inherited from the get-go: ... (2) The VSE lacks strategic merit, which can only be built upon a sufficiently vetted decision-making process of logic and analytic rigor. Especially, such process should have been scrutinized through hearings to engage the American public and politicians. Instead, the Bush VSE was a product of a blind and near-childish emotional response to a series of domestic and international geopolitical events that occurred in 2003, such as the launch of China's Shenzou-5 manned spacecraft on the 15th of October and the STS-107 (Columbia) Space Shuttle disaster in early February." Editor's note: "Blind and near-childish emotional response"? C'mon Buzz can't you try and be a little more accurate and engage in a little less armwaving to make your point? The "Bush Vision" has been repeatedly endorsed by both chambers of a Democrat-controlled Congress. Also, Buzz, I do not seem to recall hearing any of this criticism from you in 2004 when you were overtly campaigning for President Bush's re-election. While there are some interesting ideas in this document, it is a little hypocritical to see Buzz and his co-authors dump on the VSE and its return to the moon program as being "imposed [on] the American people" without enough funding only to substitute their own grandiose program which includes even bigger projects across larger regions of the solar system with an equally vague description of who foots the bill or why they would pay for it. You can't just say the words "commercialization" and "development" and expect things to just magically occur. As for their claim that this was not all discussed in the open, yes, the Bush folks were contradictory - but not at first. When the VSE was first announced Sean O'Keefe and Craig Steidle went to great lengths to open up the whole process for external input - and Buzz was there providing input. Several years later, when O'Keefe left and other political factions took the reigns, Mike Griffin came in and, in his impatience, simply swept away all that had been done before and imposed his own personal architecture. Now, several more years later, I guess it is once again time to throw all of that out too - good and bad. Small wonder nothing ever seems to get built. NASA seems to be much better at changing direction than consistently following its own direction - and space advocates seem to be the biggest cheerleaders for this constant state of turmoil. Each time there is a change in direction everyone ends up with a collective case of whiplash - only to immediately set the stage for another course change a few years hence. Imagine what this looks like to people outside the space community - taxpayers and legislators - when the people who are supposed to understand all of this space stuff keep changing their minds? Small wonder space is a third tier political issue. By Keith Cowing on February 21, 2009 2:52 PM. "The Skylon reusable space plane takes off from an airport runway, burns atmospheric oxygen, switching to liquid oxygen and hydrogen to hit escape velocity and attain orbit. At least, it will in 10 years. The plane will be designed to carry 12 tons of payload into orbit and return safely, without having wasted $100 million worth of throwaway rocket." Continue reading Today's Video: Skylon Mission Animation. By Keith Cowing on February 20, 2009 11:14 PM. "During a thorough review of space shuttle Discovery's readiness for flight, NASA managers decided Friday that more data and possible testing are required before launching the STS-119 mission to the International Space Station. Engineering teams have been working to identify what caused damage to a flow control valve on shuttle Endeavour during its November 2008 flight. "We need to complete more work to have a better understanding before flying," said Bill Gerstenmaier, associate administrator for Space Operations at NASA Headquarters in Washington who chaired Friday's Flight Readiness Review. "We were not driven by schedule pressure and did the right thing. When we fly, we want to do so with full confidence." By Keith Cowing on February 20, 2009 2:10 PM. "Autonomous military robots that will fight future wars must be programmed to live by a strict warrior code, or the world risks untold atrocities at their steely hands. The stark warning -- which includes discussion of a "Terminator"-style scenario in which robots turn on their human masters -- is part of a hefty report funded by and prepared for the U.S. Navy's high-tech and secretive Office of Naval Research." "The worries include: where responsibility would fall in cases of unintended or unlawful harm, which could range from the manufacturer to the field commander to even the machine itself; the possibility of serious malfunction and robots gone wild; capturing and hacking of military robots that are then unleashed against us ..."
By Keith Cowing on February 20, 2009 1:43 PM. "Perhaps the best of example this is @NASA, an agency that fully understands the meaning of Twitter and social media (more on that later). @NASA teases press releases and YouTube videos with tweets written by a human, among other things. The result: over 12,500 followers." By Keith Cowing on February 20, 2009 10:19 AM. By Keith Cowing on February 20, 2009 9:51 AM. "Next week I am on the agenda of the NASA Project Management Challenge training event to give a talk on "The Power of Accepting Criticism". This was a talk that I planned to give last year, but a conflict caused me to back out at the last minute. So up until last evening, I was feeling pretty good about having the speech ready, it was written a year ago, with only minor updates to polish it up. Now I think I'm going to tear that speech up and write a new one. Same topic, new info. All because of an email exchange I had last evening. Here is what I got - not as a comment to my blog, but as a direct email -- as I was waiting for my plane to take me home:"
By Keith Cowing on February 20, 2009 8:50 AM. "Voting will be open from February 20th to March 20th, 2009. 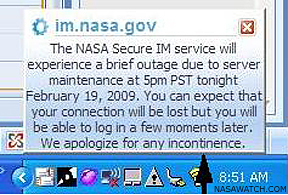 NASA will announce the winning name in April 2009. NASA wants your opinion in naming the International Space Station's Node 3 - a connecting module and its cupola - before the two segments travel to space and are installed on the orbiting laboratory. The name should reflect the spirit of exploration and cooperation embodied by the space station, and follow in the tradition set by Node 1- Unity- and Node 2- Harmony." By Keith Cowing on February 19, 2009 4:04 PM. "We have had a major milestone accomplished (well 98% of the way there). Figure 1 shows two framelets, from Lunar Orbiter II High Resolution image (we don't know which one yet). ... Figure 1 is an unknown high resolution image from Lunar Orbiter II. These are individual framelets and we are still searching to figure out which whole image that it is attached to. The lines through the images are artifacts from the demodulator that is not quite 100% working - yet. The image has boulders sitting on the surface quite easy to see. We have verified that the intrinsic resolution of these images is going to be very high, to be quantified further after we get the demod at 100% and the capstan motor replaced." No Calls or Faxes - Just Email- Thanks. By Keith Cowing on February 19, 2009 1:19 PM. Editor's update: I am told that this procurement notice is being modified. The notice itself tells people to contact the field center they are interested in and gives a link for contact information. Since the process whereby you input these notices requires contact information - and does not have a way to tell people to contact field centers - the "000" values were entered. By Keith Cowing on February 19, 2009 10:33 AM. "SPACEHAB, Incorporated (NASDAQ: SPAB), a leading provider of commercial space services, announced today that it is changing its corporate name to Astrotech Corporation. The shareholders of the Company's common stock authorized the corporate name change at the annual meeting held on Feb. 10, 2009. SPACEHAB has filed for and received approval for the name change with the state of Washington. "Astrotech Corporation is a name that more accurately reflects the Company's current mission and vision for future growth," said Thomas B. Pickens III, SPACEHAB's chairman and chief executive officer. "By aligning our corporate name with our core business offering, we are communicating to the investment community and customers the Company's new focus." By Keith Cowing on February 19, 2009 8:26 AM. Editor's 12:07 pm note: I have just received word that Konrad Dannenberg has died. Details to follow. Editor's update: According to a note from Dannenberg's family "The memorial service will be on Friday at 2:00 in the Davidson Center at the Space and Rocket Center." There will be calling hours, no wake. Just the Memorial Service. "He helped create moon rocket, but was most proud of teaching kids Yes, Konrad Dannenberg played a huge role in creating the rocket that took man to the moon. But he served an equally important function in motivating future engineers and astronauts as a lecturer at Space Camp for years after his retirement from NASA." Editor's update: According to Konrad Danneberg's wife, Jackie, "in lieu of flowers, we are requesting that people donate to the Skylab Restoration Fund at the US Space and Rocket Center Foundation. For more information, see www.spacecamp.com or call 256-837-3400." By Keith Cowing on February 19, 2009 7:27 AM. Editor's 16 Feb note: I have just learned that Tom Rogers has died. "Thomas F. Rogers, 85, a physicist and former Defense Department deputy director who, in retirement, became a prominent advocate for outer-space tourism, died Feb. 13 of kidney failure at the Vantage House nursing home in Columbia. Mr. Rogers spent much of his early career as a research administrator at the Massachusetts Institute of Technology and as deputy director of defense research and engineering at the Pentagon." Editor's note: Memorial services are being held Saturday - Feb. 21 at 1 P.M. at the Vantage House 5440 Vantage Point Road, Columbia, MD 21044. By Keith Cowing on February 18, 2009 11:25 AM. "At a meeting in Washington last week, National Aeronautics and Space Administration and European Space Agency officials decided to continue pursuing studies of a mission to Jupiter and its four largest moons, and to plan for another potential mission to visit Saturn's largest moon Titan and Enceladus. Both of these proposed missions are grand endeavors that set the stage for future planetary science research. These outer planet flagship missions could eventually answer questions about how our solar system formed and whether life exists elsewhere in the universe." By Keith Cowing on February 17, 2009 7:36 PM. "NASA's Lunar Reconnaissance Orbiter, or LRO, spacecraft was loaded on a truck Wednesday to begin its two-day journey to NASA's Kennedy Space Center in Florida. Launch is targeted for April 24." As of this morning LRO was notified that problems with the WSG spacecraft have made it impossible for ULA to launch LRO/LROCSS on 4/24/2009. The next set of LRO/LCROSS launch days opens on 5/7/2009. Both LRO and ULA are replanning for 5/7/2009 as of this morning. Please note that this is unrelated to the booster tank issues and that there are still unresolved issue with a west coast Delta launch (STSS) that is scheduled for 5/5 and will have to move to late May to enable ULA/KSC to launch LRO/LCROSS on 5/7. The current thinking is this will be arranged but is not yet confirmed. The details of our replanned schedule, and any changes to planned activities, are not yet sorted out. Once we have the new ULA integration schedule (expected today) we'll replan the details of the LRO schedule and send it to all involved. Editor's 16 Feb note: Curiously, nearly a week after this internal email was circulated to LRO project staff, NASA has not yet admitted (officially) that LRO's launch date has been slipped. Yet if you visit this KSC visitors center webpage you will see that the launch date listed is 7 May 2009 at 7:30 pm ET. However, the latest NASA Expendable Launch Vehicle Status Report shows a 24 April launch date and states "There is no formal request to NASA from United Launch Alliance, or ULA, to change the launch date of the Lunar Reconnaissance Orbiter from April 24. Informal discussions are ongoing between NASA, ULA and the Air Force to understand the needs of ULA's launch clients, including the Air Force and its Wideband Global Satcom spacecraft. LRO and LCROSS continue to work towards the earliest possible launch date until a formal determination can be made otherwise." So why is the LRO Project Manager teling his team that it is "impossible for ULA to launch LRO/LROCSS on 4/24/2009"? Editor's 17 Feb update: Someone @KSC must have dumped on the KSC Visitor's Center. Their calendar page now shows a 24 April launch date for LRO. However, this LCROSS press release from ARC won't name a specific launch date and only says "in preparation for a spring launch" instead. By Keith Cowing on February 17, 2009 4:08 PM. Editor's 30 Jan note: I keep hearing the name Lester Lyles mentioned as a possible choice for NASA Administrator. He was a senior Obama campaign advisor, served on the President's Commission on U.S. Space Policy, has extensive space experience from his days in the USAF, is participating in the ongoing NAS study "Rationale and Goals of the U.S. Civil Space Program", and is also a member of the NASA Advisory Council. Unlike Scott Gration, Lyles has obvious space creds. I have always been impressed by him. This of course could mean absolutely nothing - just idle chatter on a Friday - and what fun is a Friday without some unsubstantiated rumors and gossip, eh? Editor's 17 Feb update: Lyles' name is suddenly making the rounds again here in Washington - this time with much more of an air of certainty. By Keith Cowing on February 17, 2009 8:50 AM. "During the debate on the economic stimulus proposals in the House, many different standards were used by my colleagues to justify policies and proposals eligible for funding. But there are some standards that are universally accepted as ones worthy of government investment: Does it advance our national interests, does it create jobs and does it serve as a worthwhile investment both in time, energy and resources? Our nations space program meets these criteria. It has throughout its rich history and, based on current and scheduled missions, it will in the future. The debate across our government generally, and frankly within NASA specifically, about funding priorities is a good one. A blank check, especially written by the government, is not a good management incentive for innovation in my opinion." By Keith Cowing on February 16, 2009 11:19 PM. By Keith Cowing on February 16, 2009 5:06 PM. Editor's note: To my non-expert eye this looks like a daytime version of what is usually only seen at night: a large meteorite zipping through the lower regions of Earth's atmosphere - not a piece of a smashed satellite. Continue reading CNN Video: Mystery fireball seen in sky in Texas. By Keith Cowing on February 16, 2009 5:03 PM. Editor's note: In this video, President Obama speaks about the value of science and technology and our future workforce. Continue reading Today's video: President Obama Speaks About Science and Technology. By Keith Cowing on February 15, 2009 9:35 PM. "Former astronaut Harrison Schmitt, who walked on the moon and once served New Mexico in the U.S. Senate, doesn't believe that humans are causing global warming. "I don't think the human effect is significant compared to the natural effect," said Schmitt, who is among 70 skeptics scheduled to speak next month at the International Conference on Climate Change in New York. Schmitt contends that scientists "are being intimidated" if they disagree with the idea that burning fossil fuels has increased carbon dioxide levels, temperatures and sea levels. "They've seen too many of their colleagues lose grant funding when they haven't gone along with the so-called political consensus that we're in a human-caused global warming," Schmitt said." By Keith Cowing on February 15, 2009 3:56 PM. "From what I understand with past budgets, NASA's exploration budget generally goes to development and since Ares is part of the new program development and it is one that is behind and in need, then the money would probably go to it" and the Orion crew capsule and a lunar lander, said Keith Cowing, who runs the space agency watchdog Web site NASAWatch.com. Cowing said the language did not exclude using the money for shuttle missions, either. "That's probably not likely, but it is not forbidden," he said." By Keith Cowing on February 13, 2009 11:17 PM. "NASA will hold a news conference Friday, Feb. 20, following a review of space shuttle Discovery's readiness for flight and an assessment of shuttle flow control valve testing. An official launch date for the STS-119 mission has not been set, but for planning purposes, liftoff now is targeted for no earlier than Feb. 27. The new planning date is not expected to affect the launch dates for missions that will follow Discovery's flight, STS-125 to NASA's Hubble Space Telescope and STS-127 to the International Space Station." "Initially slated for launch this week, NASA wanted more time to review analysis and test results of potentially troublesome valves needed to keep the shuttle's fuel tank properly pressurized during the 8.5-minute ride into space." By Keith Cowing on February 13, 2009 3:07 PM. "At the moment, the $400 million in NASA exploration funds likely would go toward the Constellation program, a new system of rockets and capsules that NASA has designed to replace the space shuttle and return American astronauts to the moon by 2020." Sciences ($400M) to remain available until Sept. 30, 2010. Funding to be used to accelerate Earth Sciences Decadal missions (climate change), and to increase the agency's supercomputing capabilities. No breakout between the two activities. The House bill stipulated that at least $250M shall be for Earth Sciences. Aeronautics ($150M), to remain available until Sept. 30, 2010. For aviation safety, environmental impact mitigation, and NextGen. Exporation ($400M), to remain available until Sept. 30, 2010. For "exploration." No other guidance. Cross Agency Support ($50M), to remain available until Sept. 30, 2010. "NASA shall give its highest priority to restore NASA-owned facilities damaged during hurricanes (Hurricanes Ike and Gustav) and other natural disasters during CY 2008." Inspector General ($2M), to remain available until Sept. 30, 2013. 1:00 - 2:00 p.m. Conference Report to (http://thomas.loc.gov/cgi-bin/bdquery/z?d111:HR1:/) H.R. 1 - American Recovery and Reinvestment Act (Reps. Obey/Rangel/ Waxman Appropriations) (Subject to a Rule)"
By Keith Cowing on February 12, 2009 12:18 PM. "Everybody's talking about Web 2.0, but only some are using it. Although agencies are adopting collaborative and social-networking tools to work smarter and faster, they are doing so only in pockets. However, some of those pockets are deep. This spring, NASA's Goddard Space Flight Center will launch a social-networking Web site, named Spacebook, for employees. The site will mimic Facebook and feature individuals' profiles, expertise and personal interests, said Linda Cureton, chief information officer at Goddard." Editor's note: Something called "Spacebook" already exists. By Keith Cowing on February 12, 2009 10:20 AM. "The federal government is on the verge of reaching an agreement with YouTube that would allow agencies to make official use of the popular video-sharing service. A coalition of federal agencies led by the General Service Administration's Office of Citizen Services has been negotiating with Google, YouTube's parent company, since summer 2008 on new terms that would allow agencies to establish their own channels on the site. Agencies have not been able to post videos to YouTube (although many already have) because, under the current terms of service, people who post content on the site are subject to their state libel laws. Federal agencies must adhere to federal law. A larger obstacle has been YouTube's policy that videos are the responsibility of the person who posts the content. If federal agencies post a video on the site, the government considers it part of the public domain, and therefore does not consider itself to be liable for the content. For the federal channel, these clauses would be removed." By Keith Cowing on February 12, 2009 10:06 AM. "The astronauts on board China's third manned space mission deployed a microsat (BX-1) from their Shenzhou VII spacecraft. After release, the BX-1 came within 23km of the International Space Station (ISS). To experience how this mission unfolded, please review one of the following resources ..."
Editor's note: Looking at the video, I guess you could say that Shenzhou VII "approached ISS too". By Keith Cowing on February 12, 2009 9:43 AM. "(from the Alliance for Taxpayer Access) February 11, 2009 Last week, the Chairman of the House Judiciary Committee (Rep. John Conyers, D-MI) re-introduced a bill that would reverse the NIH Public Access Policy and make it impossible for other federal agencies to put similar policies into place. The legislation is H.R. 801: the "Fair Copyright in Research Works Act" (http://thomas.loc.gov/cgi-bin/query/z?c111:H.R.801:)." Editor's note: Just as NASA creeps towards enhanced "transparency, openness, and participation" as promoted by President Obama, legislation like that introduced by Rep. Conyers would give all federal agencies the ability (and incentive) to reduce (as opposed to expand) what the taxpaying public has as access to. By Keith Cowing on February 11, 2009 8:32 PM. "President Obama told Florida lawmakers on Tuesday that he was down to four names in his search for a new NASA chief, although Obama would not reveal the finalists, according to congressional sources. House Democrats from Florida, including U.S. Rep. Alan Grayson of Orlando, traveled with Obama during his trip to Fort Myers to tout his partys $800 billion economic stimulus plan. During the commute, Florida lawmakers had a chance to quiz the new president on a variety of issues, including NASA." By Keith Cowing on February 11, 2009 7:37 PM. By Keith Cowing on February 11, 2009 7:03 PM. "Senate and House leaders announced Wednesday evening that they had reached agreement on a $789 billion economic stimulus bill, clearing the way for final Congressional action and President Obamas signature, perhaps by the end of the week." "Senate Democrats passed an $838 billion stimulus package on Tuesday with support from three Republicans, advancing President Obamas core economic policy objective that now must be reconciled with the House." Continue reading Senate Action On Stimulus Package. By Keith Cowing on February 11, 2009 5:04 PM. "In an unprecedented space collision, a commercial Iridium communications satellite and a presumably defunct Russian Cosmos satellite ran into each other Tuesday above northern Siberia, creating a cloud of wreckage, officials said today. The international space station does not appear to be threatened by the debris, they said, but it's not yet clear whether it poses a risk to any other military or civilian satellites." By Keith Cowing on February 11, 2009 1:18 PM. "This will be a very big year for SpaceX and the NASA Commercial Orbital Transportation Services (COTS) program. In 2006, SpaceX won the NASA COTS competition to demonstrate transport of cargo and optionally crew to and from the International Space Station. Under that agreement, SpaceX will conduct the second flight of its Falcon 9 launch vehicle and first flight of its Dragon spacecraft in 2009. The final flight, scheduled for 2010, will demonstrate Dragon's ability to berth with the Space Station." By Keith Cowing on February 11, 2009 9:57 AM. "Rome, Italy - NASA makes official the flight of shuttle that will transport on ISS the instrument for this study. (WAPA) - The antimatter-hunting becomes reality. NASA has officially scheduled for September 16th, 2010, the mission Shuttle STS-134, that will transport on the International Space Station (ISS) the AMS (Anti-Matter Spectrometer), the European ambitious lab for the particle physics, carried out with an important contribute by Italy." By Keith Cowing on February 11, 2009 8:23 AM. ""Alan Stern, a planetary scientist and former NASA associate administrator for science missions, charged in a New York Times op-ed column last year that the cost overruns of the Mars Science Laboratory are a sign of a "cancer" of spending profligacy that is overtaking the space agency. Stern, now a private consultant, argues that the new rover is too ambitious, with too many new technologies in play, making a cost overrun all but inevitable. "It's not just that it's a bigger rover. It's also an entirely new kind of landing system. It's also that it's nuclear-powered. It's also that it's carrying multiple instruments far beyond what's ever been done," Stern said in an interview. "We need to go to a strategy where we can access Mars frequently and take advantage of what we've already invented." By Keith Cowing on February 10, 2009 3:47 PM. Editor's note: Presentations from the 5 February session of the NASA Advisory Council (NAC) meeting in Cocoa Beach are now online. This is amazing. The previous NAC management would drag their feet, often taking months to post anything - and that's if they ever actually posted anything on their own volition. Usually it required FOIA requests and lots of complaints before they'd respond. Looks like "transparency" to me! By Keith Cowing on February 9, 2009 6:30 PM. "His Air Force and administrative experience will come in handy when Gration takes the helm of NASA as the head administrator." Editor's 1:44 pm EST note: It would seem that Whorunsgov.com ("A Washington Post Company Publication") is about a month behind the times as far as next NASA administrator trial balloon derby is concerned. Editor's 6:30 pm EST update: They updated their website. It now says "Current Position: Adviser to President Barack Obama (since 2006)". By Keith Cowing on February 8, 2009 10:00 AM. "I've got a video that you need to watch, but first I need to explain why you need to watch it and what lesson I hope you will take away. Recently I had a couple of events which affected my thinking on this. I have been out of the Shuttle Program manager job for almost a year now and a trusted coworker just a week ago told me that people in his organization had been prevented from giving me important alternative choices for some program choices that occurred a couple of years ago. This was staggering. It was happening right in front of me and I was totally unaware that people - who I trusted, who I hoped would trust me - kept their lips sealed because somebody in their middle management made it clear to them that speaking up would not be good. Editor's 30 Jan note: A number of readers have wondered if this video will ever end up on NASA TV ... THAT would be interesting. Editor's 2 Feb update: Wayne just posted this follow-up to his earlier blog entry. I have always been impressed with Wayne. This blog posting by Wayne and its follow-up simply serve to underscore that impression. "After making a blog post, two or three days may pass before I get back to see what comments have come in and to post those that are pertinent (it is surprising how many pharmaceutical companies I have never heard of want to post their ads in blog comment spaces). However, my email overflowed this weekend with comments to my last post. This evening, I have posted almost of those comments at this site. I have also been reading some of the comments on other parts of the internet, I think it is time to refocus as we start the week." "A short, satirical video produced by an astronaut and posted on YouTube is generating a lot of discussion within NASA and the space community. The video focuses on making sure the agency's bureaucracy doesn't crush innovative ideas and dissenting opinions. The video, written and filmed by four-time space flier Andrew Thomas, tells the fictional story of a young engineer at Johnson Space Center in Houston who has a great new concept for a spacecraft design." By Keith Cowing on February 7, 2009 7:05 PM. "Disagreements between the White House and some senior Democratic lawmakers have complicated the choice of the next U.S. civilian space chief -- and led to the emergence of a possible compromise candidate. Retired four-star Air Force Gen. Lester L. Lyles is now viewed as new contender to head the National Aeronautics and Space Administration, according to lawmakers and aerospace industry officials. Gen. Lyles once headed the country's missile-defense program and more recently participated in blue-ribbon commissions studying manned space exploration." By Keith Cowing on February 7, 2009 5:47 PM. "Q Robert, the James A. Baker Institute is recommending that the Obama administration defer another lunar shot, and instead focus on energy and climate change. Does the White House have a reaction on that? MR. GIBBS: I don't have anything particularly from -- I would point you to folks over at NASA. I don't have any particular guidance on that." By Keith Cowing on February 6, 2009 6:34 PM. "Because of an ongoing review of the space shuttle's flow control valves, NASA managers are rescheduling meetings next week to assess the launch readiness of shuttle Discovery's STS-119 mission to the International Space Station. The Space Shuttle Program will hold a meeting Feb. 13 to review data and determine whether to move forward with a flight readiness review on Feb. 18. The official launch date will be set at the readiness review, but for planning purposes launch now is no earlier than Feb. 22." "Just in from NASA: The launch of space shuttle Discovery to the international space station has been delayed at least three more days and is now scheduled to lift off from Kennedy Space Center on Feb 22. at the earliest." John Shannon Is "Insufferable" and "Smothers Astronauts"
By Keith Cowing on February 6, 2009 1:44 PM. "Moments after having their shuttle launch delayed, Discovery astronauts complained once again Monday about John Shannon--that annoying little program manager who insists on every detail of every space mission being exactly right. Shannon, who is reportedly always double-checking launch parameters for no good reason, and sticking his nose into parts of the spacecraft that have always worked just fine, delayed the NASA flight for the third time this past month. ... The insufferable perfectionist's fixation goes beyond ship maintenance and safety, however. In the past six months, Shannon has totally smothered Discovery astronauts, forcing them to complete endless navigation simulations, practice sea survival techniques despite the lack of water in space, and train for all kinds of hypothetical emergency evacuations, the vast majority of which will never even happen." By Keith Cowing on February 6, 2009 8:32 AM. "NOAA-19 is in a nominal orbit with all spacecraft systems functioning properly," stated Wayne McIntyre, the NASA POES Project Manager. "The NASA/NOAA partnership continues to produce enormous results with environmental missions, now exceeding more than three decades." "Proximate Cause: The NOAA N-PRIME satellite fell because the LMSSC operations team failed to follow procedures to properly configure the TOC, such that the 24 bolts that were needed to secure the TOC adapter plate to the TOC were not installed." Continue reading NOAA-N Prime (NOAA-19) Is On Orbit and Doing Fine. By Keith Cowing on February 5, 2009 4:17 PM. "We have submitted a paper to the Lunar Planetary Conference (LPSC) for presentation in March of 2009. This paper will detail the process that we used to bring the first image of the Earth as seen from the Moon back to life and the first determination of its quality as compared to the Lunar and Planetary Science database image." "The first machine continues to perform well. There are problems that were anticipated that we are dealing with. One of the overall reliability issues is that many electronic parts in the machine are customer Ampex hybrid circuits that are obviously not available anymore." "NASA's Exploration Systems Mission Directorate and Innovative Partnerships Program Office in Washington provided initial funding for the project. Engineering and logistics for the project team were provided by Wingo of SkyCorp, Inc., Huntsville, Ala., with donated services by Keith Cowing from SpaceRef Interactive, Inc., Reston, Va., under the auspices of Alliance of Commercial Enterprises and Education for Space, and the NASA Lunar Science Institute." By Keith Cowing on February 5, 2009 10:42 AM. "The launch of the NOAA-N Prime weather satellite for NASA and NOAA aboard a United Launch Alliance Delta II rocket has been postponed for an additional 24 hours. A payload fairing air conditioning compressor at the launch pad has failed. This unit provides cool, dry air inside the fairing prior to launch." By Keith Cowing on February 4, 2009 1:35 PM. Editor's note: Today's cool new Twitterer: Nobel Laureate Baruch Blumberg who now Twitters as @BBlumberg. My business parner @marckboucher notes: "Nobel Laureate & great guy @bblumberg is now Twittering. I once watched Gattaca with him in the high arctic in a Mars analog habitat." I have had the extreme pleasure of knowing Barry for more than a decade. I recall one time when he and I shared one (or two) bottles of wine at dinner as he talked about rockclimbing in Wales when he was "only in his sixties". His interests are many. He is truly what people mean when they refer to someone as being a "Renaissance man". Its when people like Barry take to this new technology that barriers begin to fade. Barry is currently working at the Lunar Science Institute at NASA ARC as Senior Scientist. Photo: L to R: Marc Boucher, Pascal Lee, Skou Crawford, Barry Blumberg, and Bill Clancy inside the Mars Arctic Research Station on Devon Island, August 2000. By Keith Cowing on February 3, 2009 11:39 PM. "Forgetting politics for a moment, the folks at NASA have managed to come up with a good guess at how such a rover might work - and have created something that you can drive. More importantly you can use it to perform meaningful work. To be certain, this is a vehicle that is designed to work on Earth - pneumatic tires, no life support system, etc. But that is not what it is designed to test. Rather, it is designed to be used as a rover might be used on the moon - not how you'd build the subsystems etc. for an actual moon rover. Once the utility requirements are firm, then you go and design the actual lunar rover. " By Keith Cowing on February 3, 2009 8:56 PM. "During a review of space shuttle Discovery's readiness for flight, NASA managers decided Tuesday to plan a launch no earlier than Feb. 19. The new planning date is pending additional analysis and particle impact testing associated with a flow control valve in the shuttle's main engines. Discovery's STS-119 mission to the International Space Station originally had been targeted for Feb. 12. The valve is one of three that channels gaseous hydrogen from the engines to the external fuel tank. One of these valves in shuttle Endeavour was found to be damaged after its mission in November. As a precaution, Discovery's valves were removed, inspected and reinstalled." By Keith Cowing on February 3, 2009 8:14 PM. "With little notice, the president and first lady Michelle Obama bolted the gated compound of 1600 Pennsylvania Ave. in their tank of a limousine on Tuesday. They ended up at a Washington public school, greeted by children who could not care less about the collapse of a Cabinet secretary nomination. ... He was upbeat. He and his wife read the students a book about the inspirational story of astronauts landing on the moon. He took a class photo, accepted hugs from the children, thanked them for pictures they made him, and even delivered them a couple of brown-paper bags full of books." 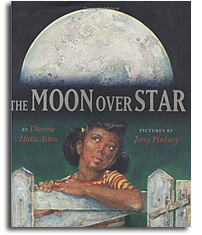 "After pleasantries, the president and Mrs. Obama began to read "The Moon Over Star" by Dianna Hutts Aston, illustrated by Jerry Pinkey. The book is about Neil Armstrong's moon landing. A White House handout noted that "for the young protagonist of this lyrical and hopeful picture book, that landing is something that inspires her to make one giant step toward all of the possibilities that life has to offer." ... When the story was over, the president said, "That's a nice book." Then he asked who wanted to be an astronaut. One student said yes. "What else do people want to be?" he asked. The replies included doctor, football player, and sculptor. One boy wanted to be president. "I think you might make it," the president said." By Keith Cowing on February 3, 2009 7:35 PM. "Under the worst-case scenario, such vibrations could rattle the station so much over the long term that the structure might begin to crack and leak. One of the solar arrays might bend out of position, affecting the station's power-generating system. Experts cautioned that it was too early to determine how likely or unlikely these scenarios might be." "Reboost Oscillations Update: As structures specialists continue in-depth loads analysis of the 1/14 reboost anomaly, the call for the next reboost on 2/4 with the SM twin main engines is awaiting a Go/No-Go decision, to be made by the joint IMMT (ISS Mission Management Team) on Monday (2/2). [As of now, evaluation of the external video survey conducted over the last weekend and a review of subsystem data have not shown any off-nominal results.]" "Reboost Oscillations: Joint assessment of the offnominal reboost on 1/14 is continuing. Moscow reported that the root cause of the observed strong structural oscillations was an error in parameter settings uploaded to the SM engine gimballing control system, which then caused a malfunction of a dynamic (frequency) control filter. Both the MCS (Motion Control System) and the filter itself are continuing to function properly. Corrective measures are underway." "ISS Reboost: Today's planned reboost using the SM main engines was successfully performed at 1:06pm EST, with a burn duration of 2 min 22.4 s. Total delta-V achieved was 3.05 m/s (3.05 m/s planned). Mean altitude increase was 5.36 km (2.89 nmi). Science windows in JPM and Lab were closed for the thruster firings. The reboost is the first of two reboosts used to set up phasing for the STS-119/15A and 32P launches." Continue reading Today's Video: We got a wicked shimmy up here. By Keith Cowing on February 3, 2009 1:07 PM. "What happens when you pair a futurist who believes that machine intelligence will overtake human intelligence with one of the world's leading champions of space flight?" "In June, Singularity University is scheduled to open with a faculty replete with scientific celebrities, and an initial class of 30 students at NASA's Ames Research Center in Silicon Valley. The subjects taught over a nine-week period are a menu of the disciplines whose exponential advancement Kurzweil suggests will overturn the world as we know it--nanotechnology, robotics, artificial intelligence, biotechnology, energy, and more." "The school will be based on NASA's Silicon Valley campus and revolve around the concept that the exponential advances occurring in various fields should be melded to solve daunting problems like poverty, famine, disease, global warming and dwindling energy supplies." Editor's 3 Feb 6:00 am EST note: Wow, look at all of the great PR that has suddenly emerged regarding the Singularity University at ARC - including banner placement on the Drudge Report. Great news, right? You'd think that NASA PAO would be all over this, with press releases, background papers, links on their website ... Well, you would think that they'd do that. Instead, I can find nothing about the Singularity University at the ARC website. And when I search the ARC website for the word "Singularity" what do I find? Certainly nothing about the Singularity University or ARC's participation. Same result for a search of all of NASA. Its not as if this is some big secret. Every news outlet on Earth seems to know about it. I just don't get it. NASA is involved with something so amazingly cool like this - and yet they just say nothing about it while everyone else is talking about it. Maybe all of these new cool, hip, smart people walking around the ARC campus can teach PAO how to tell people about all the fascinating, cool, relevant, and exciting things NASA folks do. Editor's 3 Feb 1:03 pm EST update: I first learned of this ARC press release ("NASA Ames Becomes Home To Newly Launched Singularity University") via this ARC Twitter posting today at 1:03 pm EST - even though the rest of the world was reading about this online and in print up 12 hours - or more - ago. This press release from Singularity University hit Marketwire around 9:00 am EST. By Keith Cowing on February 3, 2009 12:14 PM. As seen during the Super Bowl. Video below. Continue reading Today's Video: Bridgestone - Moon Dancers. By Keith Cowing on February 3, 2009 9:38 AM. "A new report from Houston's Baker Institute declares that NASA should give up for now any ambitions of rocketing humans to the moon and focus instead on delivering payoffs in energy and the environment -- especially for climate change. Arguing that the space agency has an opportunity to prove "its relevance in the post-Cold War world," researchers at Rice University's Baker Institute of Public Policy urged the Obama administration to place the space agency on the front lines of efforts to harness electricity from such alternative energy sources as wind and solar power." By Keith Cowing on February 3, 2009 9:22 AM. Microsoft Office 2007 is coming! To that end, ODIN Customer Outreach will conduct differences training starting early February. It is our desire to present information that will be useful to your organization. Continue reading ODIN Introduces Microsoft Office 2007 - in 2009. By Keith Cowing on February 3, 2009 7:07 AM. "The launch of the Omid satellite, meaning Hope, was timed to coincide with the 30th anniversary of the Islamic revolution and United Nations talks aimed at stopping Iran's nuclear programme. "Dear Iranians, your children have put the first indigenous satellite into orbit," said President Mahmoud Ahmadinejad in a broadcast on state television. "With this launch the Islamic Republic of Iran has officially achieved a presence in space." The launch has highlighted international concerns that Iran will use domestically developed space technology to develop intercontinental nuclear missiles." By Keith Cowing on February 2, 2009 2:04 PM. "NASA and Google announced Monday the release of a new Mars mode in Google Earth that brings to everyone's desktop a high-resolution, three-dimensional view of the Red Planet. Besides providing a rich, immersive 3D view of Mars that will aid public understanding of Mars science, the new mode, Google Mars 3D, also gives researchers a platform for sharing data similar to what Google Earth provides for Earth scientists." "Today Google has released a major new version of Google Earth - Version 5. Clearly this new release merits moving up to the next version number. It contains a wealth of new data and features and has substantial new interface changes. This is exciting stuff!!" By Keith Cowing on February 2, 2009 12:53 PM. Editor's note: Buzz Aldrin and his "Elvis glasses" made it onto TMZ. Interesting comments about going back to the Moon. By Keith Cowing on February 2, 2009 11:31 AM. "The launch of the NOAA-N Prime polar-orbiting weather satellite for NASA and the National Oceanic and Atmospheric Administration, or NOAA, aboard a United Launch Alliance Delta II rocket is scheduled for Wednesday, Feb. 4." "As the NOAA-N Prime spacecraft was being repositioned from vertical to horizontal on the "turn over cart" at approximately 7:15 PDT today, it slipped off the fixture, causing severe damage. (See attached photo). The 18' long spacecraft was about 3' off the ground when it fell." By Keith Cowing on February 1, 2009 2:12 PM. "The ceremonies and dedications to the crew of Columbia were painful to the space community. But they were set along familiar themes that Americans have come to know as traditional. But on the day following the dedication, a memorial was held in Washington, DC which marked a wholly different national tradition. Several hundred invited guests gathered at the Embassy of Israel on that cold, wet night to remember Ilan Ramon. Daniel Ayalon, Israel's Ambassador to the United States began the event by recalling his pride at the launch of the mission. He talked of Ilan as the son of a holocaust survivor, a veteran of many dangerous missions in the defense of the Israeli nation, and the country's first astronaut. His story, he said, epitomized the story of Israel and the Jewish people. The entire country had been waiting for Columbia to return, and Ayalon said, the pain of its loss would always be with them."